AV Receiver Amplifier Section	Channel	5.1 Rated Output Power (1kHz, 1ch driven)	115 W (8 ohms, 0.9% THD) Rated Output Power (20Hz-20kHz, 2ch driven)	80 W (8 ohms, 0.09% THD) Maximum Effective Output Power (1kHz, 1ch driven) (JEITA)	140 W (8 ohms, 10% THD) Dynamic Power per Channel (8/6/4/2 ohms)	110 / 130 / 160 / 180 W Surround Sound Processing	CINEMA DSP	Yes (3D) DSP Programs	17 Virtual Presence Speaker	Yes SILENT CINEMA / Virtual CINEMA DSP	Yes (Virtual CINEMA FRONT) Dolby TrueHD	Yes Dolby Digital Plus	Yes DTS-HD Master Audio	Yes Audio Features	Compressed Music Enhancer	Yes (including for Bluetooth�) YPAO sound optimization	Yes Adaptive DRC (Dynamic Range Control)	Yes Initial Volume & Maximum Volume Setting	Yes Audio Delay	Yes (0-500 ms) 192kHz/24-bit DACs for all channels	Yes (Burr-Brown) Video Features	4K Ultra HD pass-through	Yes HDMI 3D pass-through	Yes HDMI Audio Return Channel	Yes Deep Color/x.v.Color/24Hz Refresh Rate /Auto Lip-Sync	Yes Extensive Connection	HDMI Input/Output	6 in / 1 out (HDCP 2.2: 1 in / 1 out) HDMI CEC	Yes USB Input	iPod� / iPhone�, USB memory, portable audio player Network Port	Yes Connectivity	Wi-Fi	Yes (with Wireless Direct) AirPlay	Yes Bluetooth	Yes (AAC) Extensive Connection	Front AV Input	USB / mini-jack Digital Audio Input/Output: Optical	1 / 0 Digital Audio Input/Output: Coaxial	2 / 0 Analog Audio Input/Output	4 (front 1) / 0 Composite Video Input/Output	4 / 1 Preout	Subwoofer (1 x mono) Headphone Output	Yes Tuner Section	FM/AM Tuner	Yes User Interface	On-screen display	Yes (color OSD) SCENE	SCENE (4 sets) App Control	Yes (iPhone� / iPad� / Android� phone / tablet) Remote Control Unit	Yes General	Standby Power Consumption (IR only)	≤0.1 W Auto Power Standby	Yes ECO mode	Yes Dimensions (W x H x D)	17-1/8� x 6-3/8� x 12-3/8� (17-1/8� x 8-3/4� x 12-7/8� with antenna) Weight	17.9 lbs. Speakers Model	NS-PZ40BL Cabinet Type	Plastic Front Speakers	Speaker Size	2-3/4� full-range cone Dimensions (W x H x D)	4-3/8� x 6-7/8� x 4-5/8� Weight (lbs.) 1.3 lbs. (each) Center Speaker	Speaker Size	2-3/4� full-range cone Dimensions (W x H x D)	10-7/8� x 4-3/8� x 4-5/8� Weight (lbs.) 1.61 lbs. 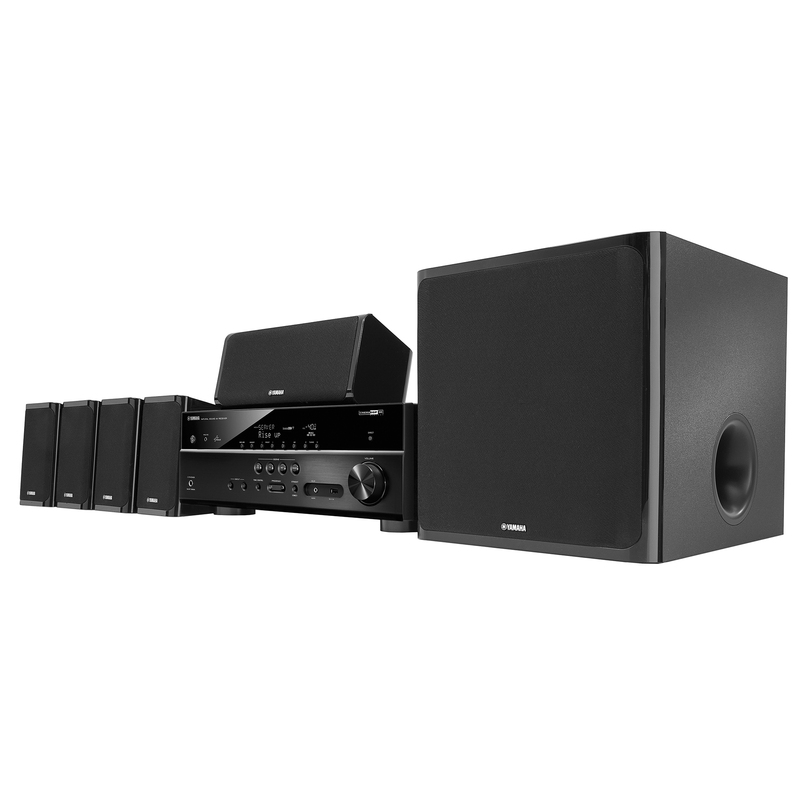 Surround Speakers	Speaker Size	2-3/4� full-range cone Dimensions (W x H x D)	4-3/8� x 6-7/8� x 4-5/8� Weight (lbs.) 1.3 lbs. (each) Subwoofer	Model	NS-SW40BL Power Output	100 watts Driver Size	6-1/2� cone Dimensions (W x H x D)	11-3/8� x 11-1/2� x 12-7/8� Weight (lbs.) 17.6 lbs.